A so-called MLM company is recruiting students with promises of big earnings. Blanca Civit tells about her experiences with this ‘smoothie mafia’. At a couchsurfing event for internationals, Blanca Civit was approached by a salesman for WIN Worldwide. This is an MLM company that seems to have a lot in common with a pyramid scheme, although it does sell actual products. The company actively recruits individuals – including university students – to become their salespeople and sell their ‘healthy’ products through a network of acquaintances, family and friends. The company tries to lure these salespeople in with promises of big earnings. Candidates have to pay a fee in order to become a member. As with a pyramid scheme, only people at the top of the pyramid seem to make the real big bucks. Although court cases have been filed against the company, no Dutch judge ever ruled its seemingly dubious practices to be part of a pyramid scheme. You might have heard of multi-level marketing (MLM): companies that sell products only through a network of friends or through alternative promotion methods. Wellness International Network is one of them, and in addition to selling their products, they also actively recruit people – including university students – to become their salesmen. It was supposed to be a normal night out in Groningen. I arrived in the pub where couchsurfing events are organised to meet new internationals and to have an informal drink. A young student wearing a fancy suit approached me and started talking about the city, how complicated life is for international graduates and how we deserve to have successful jobs. He told me that he is a 23-year-old entrepreneur and that he had just started his own marketing company, Levmarketing . He claimed to be a brand manager for a superfood smoothie powder imported from the United States and said that he was looking for young internationals to join his team. He eventually suggested that I should make a formal meeting to learn more about the business – he saw me as a potential candidate to work for him. I accepted and left him to order another drink. As the evening progressed, I noticed he was telling the same exact story to other internationals, which I found strange. What I found out later was that it was part of a long story of a business network that I jokingly nicknamed ‘the smoothie mafia’. It’s an American Multi-Level Marketing company (MLM) and is known alternatively as either WIN Worldwide or Wellness International Network. The company operates internationally, including in Groningen, and was founded in Dallas, Texas by Ralph Oats and his wife. According to Oats, they sell healthy products and promote wealth by making people financially independent. As he proudly claims, he transformed his ‘dropout and former truck driver’ life into that of a successful millionaire entrepreneur. Wellness International Network offers a range of health products which are sold through contacts and friends of those already involved in the company, a model that classifies it as a ‘network business’. Following a scandal about the group selling Biolean, a controversial product that contained a banned drug – ephedrine – they sought to clean up their image with a new company name: WIN Worldwide . Their product line is now called Physicians’ Health & Diet (PHD). Luiz V.D.V, the student that approached me that night, claimed to sell WIN Worldwide products and emphasised that Wellness International Network is a different company. However, the companies operate under the same website – www.wellnessinternational.com – and have the same owner. They also still sell Biolean online, but that is a newer version of the product which no longer contains ephedrine. In our second meeting at a bar, Luiz asked me to bring some yogurt from my house in order to taste the new WIN product, Daily Lift , a superfood powder that includes all the nutritional value of a full day’s serving of vegetable and fruit (according to ORAC values). As I was sitting in a bar in my business suit with my yogurt, my spoon and Luiz offering me a pink powder, the waitress looked at us like we were crazy. But I knew he wasn’t there to sell me any superfood – a pack for one month costs 60 euros – and I had no intention of buying it. He was there to recruit me for his network to become what they call a business partner. Later on, I was invited to visit their offices in Groningen to attend a presentation for new potential members. Wellness Noord is the name of the WIN Worldwide office in Groningen. Luiz explained that they share the offices because none of them work directly as a WIN salesperson. WIN’s policy is that every salesperson needs to have their own independent company in order to get an official trademark from WIN and sell Daily Lift products. But when they promote the product, they cannot advertise it in the name of WIN. Each of these supposedly independent companies has a website that directly links to the WIN website, including Luiz’s company: www.levmarketing.com. And that company cannot be found among the registered companies at the Chamber of Commerce (KVK). The same is true of a website of two more members of Wellness Noord, Ad Coffeng and Carola Boerstra; they contributed testimonials to the Wellness Noord Web site, but they also supposedly own a company called AceMarketing, whose Web site is www.doorgroeikansen.nl . None of those names appear to be registered at the KVK. But why would so many different companies sell the same product and share the same office under the name Wellness Noord? Luiz said, ‘This is the way WIN Worldwide works in order to save money and avoid extra costs of retailers’. But I wanted to know how WIN works, with facts and figures. As Coffeng and Boerstra publicly explained in one of their presentations, an enrolment payment to become a WIN seller is always required. The enrolment fees have different prices: Personal Business (99 euros), Lifestyle Member (499 euros) or Entrepreneur (999 euros). After paying this fee, you are officially authorised by WIN to sell under your own company name, as long as you follow their policy . When asked why new members need to pay to be contracted to work for WIN, Luiz answered, ‘It covers the costs of a personal website that WIN creates when you become a seller’. It was a bit awkward to go to their virtually empty office on a Sunday morning. There were only four new people attending this WIN introduction meeting. Other WIN partners were there in the audience, mostly older Dutch couples and young graduates, all dressed in business attire. After the presentation, free food and smoothies were offered as a way to network and talk to new people about the business. They do this several times a week as a way to find potential WIN brand partners or simply to sell their products. During the business presentation, they promised an opportunity that will allow salespeople to become financially independent and earn money quickly with a simple strategy: you need three loyal friends who will buy your products, and you will receive commission for each product sold. After that, you can create your marketing strategy and start finding more clients and business partners. As Luiz explained, for each new client or business partner, he gets 20 per cent commission. If this same client orders a second month of the Daily Lift product, he gets 4.5 per cent. Luiz makes an average of 400 euros net a month, which may be a reasonable income for a student, but that’s nothing in comparison to the high figure salaries that other members make. So, how do I become rich? It still sounded a lot like a pyramid scheme to me. I couldn’t help myself and I had to ask Luiz whether he thought WIN was a pyramid scheme or not. According to Luiz, pyramid schemes are companies that make money from new members’ enrolment fees without selling a real product, whereas multi-level marketing companies like WIN make money from the sales of a real product sold within a network of members. However, WIN charges money for membership, which raises the question: does a greater percentage of the total company profit come from the sold products (60 euros per monthly order) or from new member fees (from 99 to 999 euros)? In 2011, there was a court case in Amsterdam against WIN Worldwide: an ex-member claimed to have lost thousands of euros because of the company. But the Amsterdam court deemed that there was insufficient proof for the ex-member’s claims that WIN Worldwide’s operations could be classified as a pyramid scheme. Other similar court cases have been heard in the United States. Even though he is aware of the complaints about the company, Luiz seems to truly believe in the WIN business concept and his ambition is to make the world healthier and wealthier by selling superfoods. ‘Daily Lift is a long-term business. It is something for the future and it’s a different way of making money by helping others to be healthy’. WIN claims that anybody can become successful and wealthy with their business plan, no matter where you are from, your education or your country of origin. In one of their videos, they make the statement, ‘Success with WIN Worldwide results only from successful sales effort […] Your success is dependent upon how effectively you exercise these qualities.’ In other words, if you don’t make money, it’s not their fault. He’s not the only student in Groningen who has gotten into this business. Multi-level-marketing companies like WIN seem to see students and internationals as easy targets because they are typically young, ambitious and easily trained to become competitive salespeople. The night I met Luiz, we were both at a couchsurfing event which was only for internationals, and as the organiser confirmed to me later, Luiz often explains his business to everybody in hopes of finding new members, but often they run away from him. In order to attract students, Facebook promotion is the main tool, not only within Dutch but also international job groups. 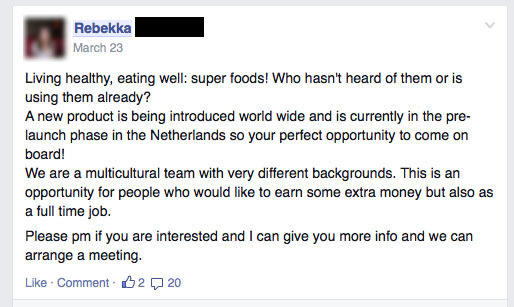 One of the student ‘brand partners’, Rebekka E., posted a message in a local group, clearly asking for new people to join the business, although she never mentioned the company by name. Many students, all in need for a job, responded to the message, but one respondent was not looking to get involved: she sought to warn the other group members. WIN members are trained with basic marketing strategies to advertise the products online through Facebook, Twitter, Pinterest and Linkedin to use as a common promotional tool. 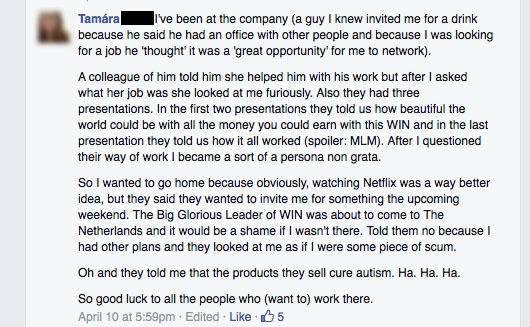 In the screenshots above, an international student explains her first contact with a WIN member in Groningen who tried to convince her of their legitimacy by saying their products can cure autism. But salespeople are also trained to promote Daily Lift in person and are encouraged to attend networking and social events like the couchsurfing one where we met and attract new people with their superfood idea. WIN members are also invited to attend national ‘training’ events and share their success stories on stage. The company does not pay for those expenses and brand partners have to cover admission costs, food and transportation themselves. But potential new members, like I was, are invited to join for free. WIN members are constantly offering free tastings to individuals and small companies such as cafes serving healthy food and fitness centres, as well as to larger organisations like HANNN, the Healthy Ageing Network North Netherlands, who collaborates with the University, UMCG and other partners. After this revelation, I had to conclude that the promotion strategies of some WIN members of Groningen were a bit vague, confusing and lacking transparency. Their distribution policy is quite unusual compared with other superfoods, which are often sold in natural stores. It was strange that it’s not possible to buy the product directly online but that consumers are always required to ask a member. That brand partners cannot sell directly ‘in the name of WIN’ and are not registered as a company is also dubious. Their business idea and the 3-person rule still sounded unclear to me. From business meetings on Sunday mornings to tasting products with my own yogurt, everything was very unusual. After speaking once more with their members in an attempt to understand their multi-level-marketing plan, they still could not provide a clear answer, just as they could not prove that the superfood product works. Despite the WIN website proudly boasting success stories of buyers and sellers of their products, one thing was clear: it’s unlikely that any students can get rich from selling smoothie powder.